* art we have personally experienced in 2016. 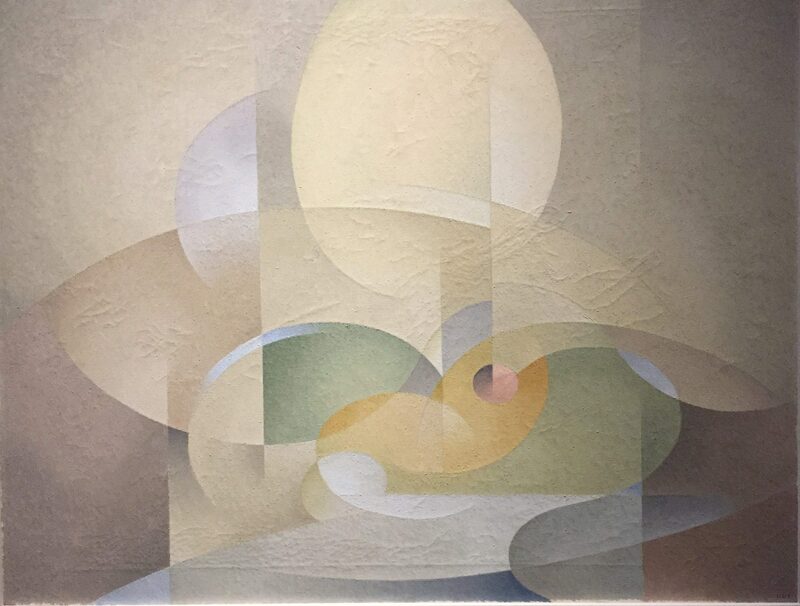 One of my favourite paintings in the Winnipeg Art Gallery’s permanent collection is Abstract: Gold and Green by Lionel LeMoine Fitzgerald. The Art Caravan has previously written about Fitzgerald because I am a huge fan of his work. Click here to read more about him, and see some of his other works. The Winnipeg Art Gallery currently has Abstract: Gold and Green on display. This entry was posted in L. L. FitzGerald, Winnipeg Art Gallery and tagged L. L. FitzGerald, Winnipeg Art Gallery on December 26, 2016 by terryvatrt. Writing about Steve Martin trumpeting Lawren Harris inevitably leads me to think of Lionel LeMoine Fitzgerald . Some of you may wonder “Who?” Fitzgerald was also a member of the Group of Seven, and the only prairie artist in the lot. FitzGerald spent most of his life in Winnipeg, with studies in Pittsburgh and New York City. He worked primarily in drawing, oil and watercolour painting and printmaking. If you click here, you can see a mural by Charlie Johnston that commemorates FitzGerald’s life in Winnipeg. I’m glad Canadian painting, and Lawren Harris in particular, are getting publicity because of Steve Martin’s interest. Wouldn’t it be great if we could match up some more celebrities with deserving artists? Any thoughts on who might be a great (or fun!) match with L. L. FitzGerald? This entry was posted in Group of Seven, L. L. FitzGerald, Winnipeg Art Gallery and tagged Group of Seven, L. L. FitzGerald, Winnipeg Art Gallery on April 21, 2016 by terryvatrt.